In November of 1954, an all out assault was undertaken to reduce the cost of operating the Powerhouse. Many of the messages of 1955 still hold true today. It is easy forget the little things, however, and the little things DO mean a lot. Below is the publication piece of the conservation effort. A Power Conservation message was printed every 2 weeks. Most of these messages appear below. 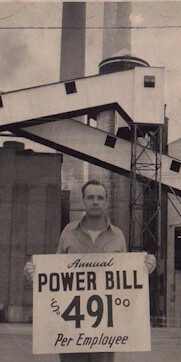 Standing with the plant power house in the background, Ray Burnett, turbine operator, displays each employee's share of the plant's power bill for the past twelve months. Power costs for the entire plant for this period was $1,473,000. When power bills are too high at home, we're careful to weatherstrip doors, turn out unnecessary lights and take other precautions to make costs fit our budget. The combined efforts of all employees in similar precautions on the job can slice several thousand dollars from the plant's power costs. An extensive program to conserve and better utilize the plant's power facilities is now in progress on the plant. This power conservation program is a part of the plant's overall cost reduction program to reduce operating cost. Such an effort is vital to the job security of each employee. The plant's power bill for the past twelve months was approximately $1,473,000 or $491 per employee. The aim of the current conservation program is to reduce this figure by some $345,000. A Power Conservation Committee was recently organized on the plant. The committee is investigating and evaluating various projects such as process changes, heat recovery systems, etc. which will aid in reducing the plant's power costs. However, a sizeable amount of any reduction must come from actual conservation of existing power services such as steam, water, compressed air, electricity and refrigeration. The success of this phase of the program depends upon the cooperation of each and every employee on the plant. A concentrated effort will be made to fully inform all employees of the ways that they can contribute to this program. No major contribution is expected from any individual. However, a combination of many relative small things such as turning off water, keeping doors closed, switching off lights not needed, etc. can result in a considerable savings. Employees are urged to be alert in looking for ways to reduce power costs in their respective areas. Suggestions from employees are considered to be a vital phase of this program. According to those who have studied this problem the most important contribution an employee can make is to follow standard operating procedures. 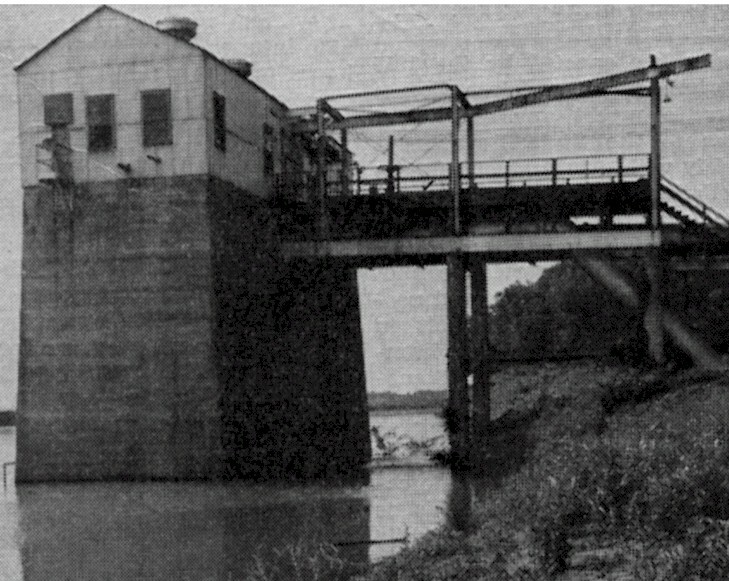 Pictured above is the plant's river pumping station. Here six water pumps pump enough water from the Cumberland River in one day to supply Old Hickory, Dupontonia and Rayon City for a period of two months. These pumps are driven by electric motors that use electricity generated in the plant Power House. The waste of water in the plant results in wasted power required to drive these pumps, wasted chemicals required for treating the water and wasted steam required to heat water. Help stop this power waste by closing water valves tight when water is not needed and adjusting water flows so that no more water is used than is needed. LITTLE THINGS MEAN A LOT. 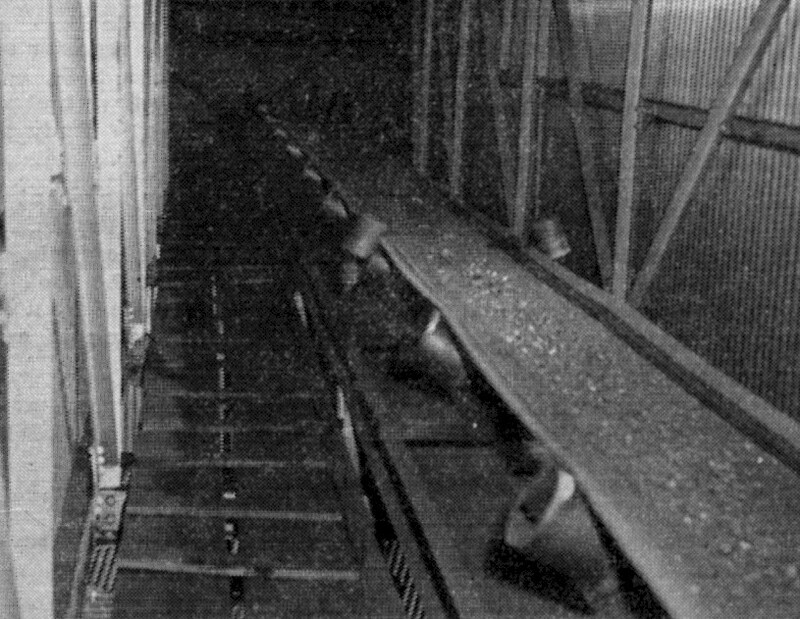 Pictured above is one of the conveyors which carries coal from coal cars to the boilers in the Power House. When there is no natural gas available 18 cars of coal are moved over these conveyors each day. This is enough coal to heat 130 average homes for one year. A waste of any power facility results in an increase of coal consumption. You can help reduce the plant coal consumption by making efficient use of compressed air, steam, water, and electricity. LITTLE THINGS MEAN A LOT. 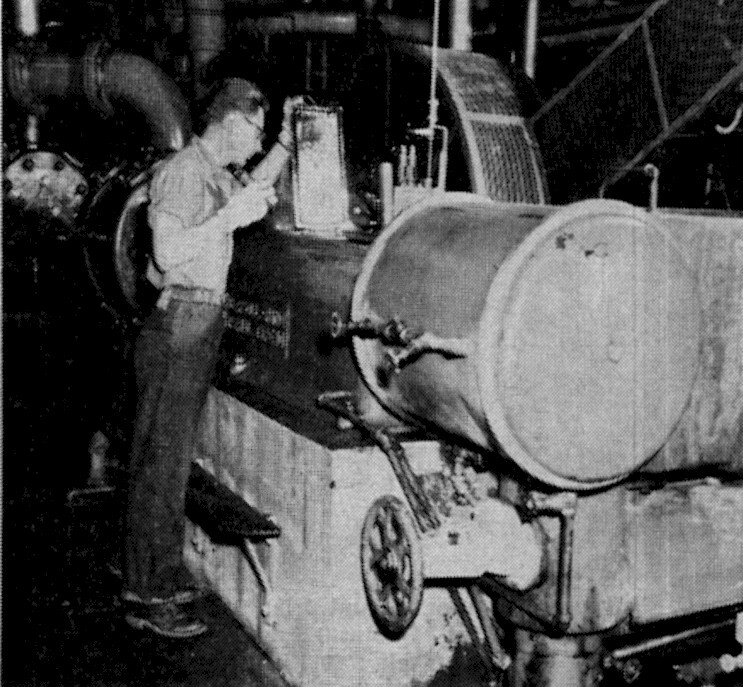 The equipment pictured above being checked by Eugene Helm, turbine operator in the Power House, is one of eight air compressors that supply compressed air to the plant. Compressed air is used to transfer viscose, drive portable power tools, sweep chemical building floors and automatic controls. The waste of compressed air causes these machines to run faster thereby increasing maintenance costs as well as fuel costs. All the air that can be compressed by the eight machines similar to the one above can be blown through holes the size of your thumb. Help slow down the wear and tear on this machine by reporting air leaks and avoiding unnecessary use of compressed air. The above generator is one of sixteen in our plant Power House. This particular machine has a capacity of 3000 KW of electricity. The plant uses an average of 22,000 KW. Hundreds of these are wasted by such practices as leaving lights on when not needed, running pumps and fans when not needed, etc. Each KW wasted represents an actual loss of money. No one of us can individually save a large amount of electricity, but collectively we can make a sizeable contribution to the reduction of our power costs. A lot of progress has been made in Power Conservation during the past four months. With the continued cooperation of everyone this progress can continue. REMEMBER -- LITTLE THINGS MEAN A LOT. 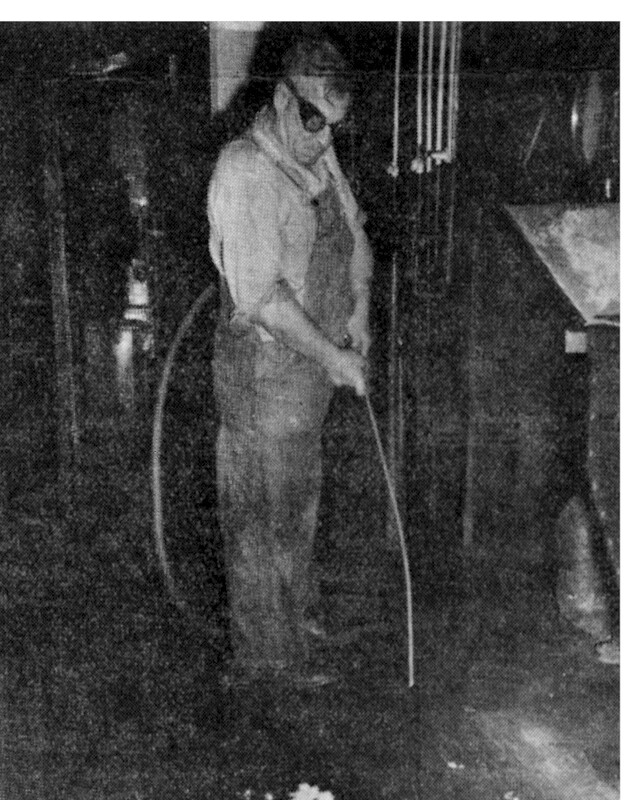 John Choate, 4h floor operator, A Shift, Plant 1 Chemical Building, uses an air hose to clean particles of shredded pulp from the floor. This is standard procedure and a waste of compressed air results only if the air is not cut off when not in use. However, a considerable savings of compressed air used on the plant can be made with the cooperation of all employees. The biggest air waste is from leaks in compressed air lines. The Power House has 8 air compressors which can produce 5000 cubic feet of air per minute. Yet the entire output of these compressors can be blown out in two holes the size of a thumb. It costs approximately 2.2 cents per 1000 cubic feet to produce compressed air. Also maintenance costs on these air compressors is high. Thus, a considerable savings can be realized when it is not necessary to operate the equipment at full capacity. All employees are requested to promptly report any leaks observed in compressed air lines or equipment. Employees using portable equipment such as blowers, jack hammers and drills can make a considerable contribution by cutting off equipment when not in use. Remember: LITTLE THINGS MEAN A LOT. 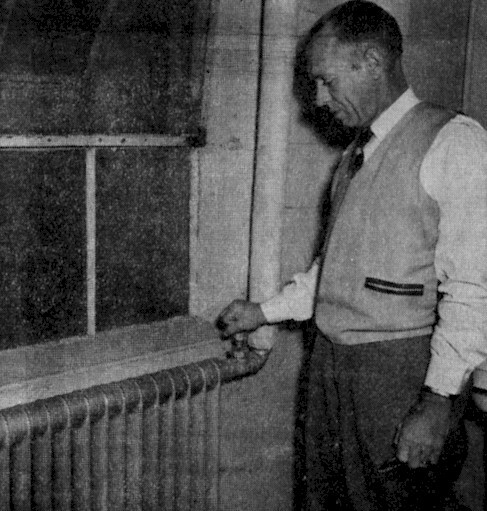 L.P. Majors of the Employment Office corrects a power waste by turning off a radiator obviously not needed. (note open window). The major portion of power used on the plant is steam. The Power House produces some 660,000 pounds of steam per hour. 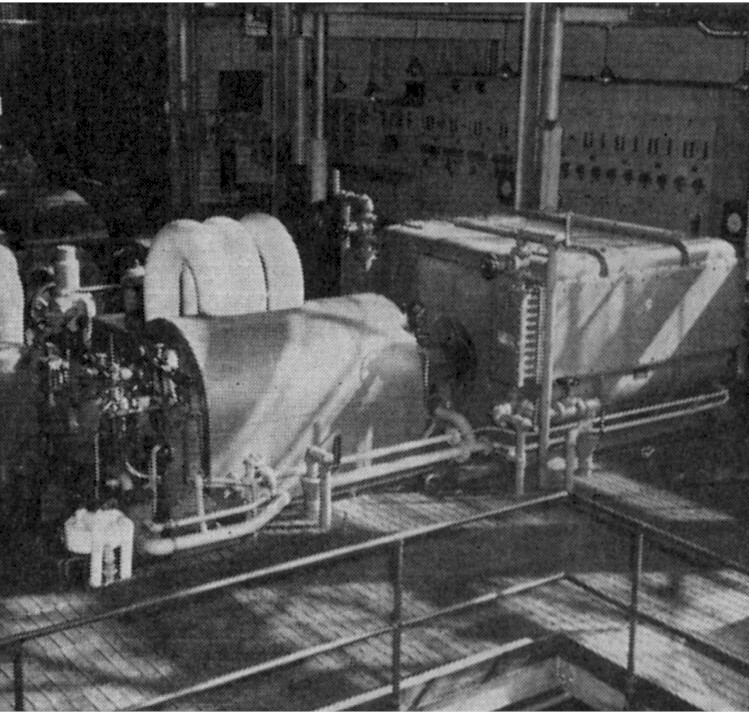 A large percentage of this steam is used in heating the spinning areas and the remainder in heating water, in radiators and units heaters, etc. As with other power facilities a lot of this steam is wasted. It is estimated that each 1000 lbs. of steam wasted costs 33 cents. Thus, if only one hour's production is wasted in a day it would cost $217.80. There are many things employees can do to help conserve steam: shutting off radiators and unit heaters not needed, avoiding excessive use of hot water, reporting steam leaks and on certain jobs keeping solutions to standard temperatures. While individually these items may represent a small savings, collectively they can amount to a considerable amount of money. The cooperation of each employee is requested in helping to save steam. Ed Chandley, Plant 2 Spinning, points out some of the many ways in which water is wasted on the plant. 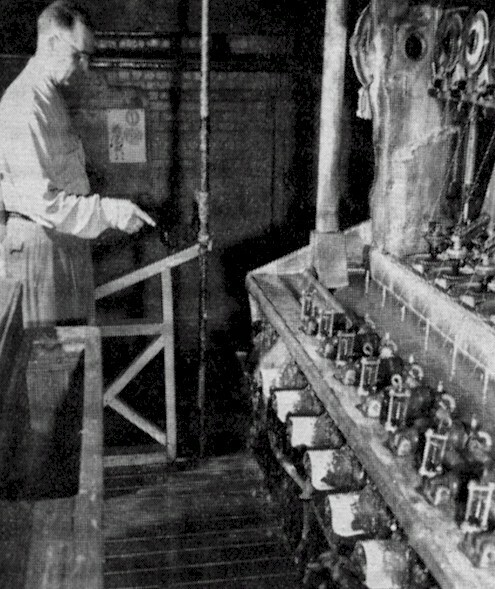 Water is used in the "goof" troughs of the Spinning machines to wash away viscose dripping from pulled jets. It is normally turned on for a few minutes while the machine is being doffed and should be turned off after the jets are back in place. If left on gallons of water are wasted down the drain. If the drain becomes plugged it can overflow out onto the floor as illustrated above. The plant pumps 20,000 gallons of water per minute or 28,800,000 gallons per day. This is enough water to supply Old Hickory, DuPontonia, and Rayon City for two months. A considerable amount of this water is wasted each day by water left running when not needed. Every employee can help save water by proper use of drinking fountains, showers, hoses, etc. and those who use water on their jobs can cut power costs by following standard practice. LITTLE THINGS MEAN A LOT.